This sparkling cloudy cider has rhubarb juice added in the brewing. Produced by Weston & Sons, in Herefordshire, their cider range was named after an old delivery truck the company used to deliver their cider. I suspect that it was driven by Rosie, and was dubbed "a pig to start and a pig to drive." Made with fresh pressed cider apples from Herefordshire, this 4% volume cider is slowly matured and left unfiltered which adds to the flavour. Rhubarb juice is also added to give it a tart finish. I do love rhubarb juice. We have a few rhubarb plants in the garden and I try to grow enough for at least one sugar filled steaming hot pudding a year. I always drink off the access rhubarb juice as well for an extra treat. On opening the 330ml can there was a light pleasing fizz and a good whiff of cider and what smelt like all the insides of a vast rhubarb crumble. Wow, there's a smell you could sell to the masses. 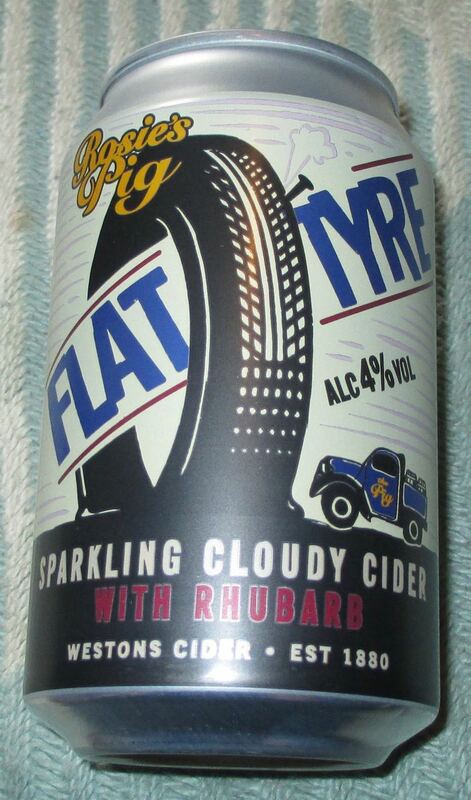 On pouring the fizzy pinkish liquid the rhubarb smell on top of the cider really came to the fore. On first taste the rhubarb does a cheerful summery jig with the cider apples right into the aftertaste. The rhubarb hit my tastebuds first and then the apples, and then rhubarb and so on like a Whirling Dervish of fruity tarty flavours. This was a un-put-down-able refreshing treat, which made me wish I had a few more cans to enjoy!